Fires | Fireplaces | Stoves: What Is The Difference Betwen Normal And High Efficiency Fires? 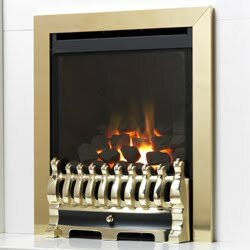 What Is The Difference Betwen Normal And High Efficiency Fires? With everyone feeling the pinch in this fragile economy, the tough recession of last year and rising energy prices efficiency of your gas fire is a big concern. When purchasing a gas fire you will see a number of fires with HE or High Effiency in the title, but what is the difference between these and the normal ones? and how does a fire get HE or High Efficiency in the title? In all honesty any manufacturer could stick HE or High Efficiency in the name of a fire if it was above their average efficiency rating, this could be done as a marketing ploy or as a reason to raise the price a little bit. This, while under-handed is not a commonplace tactic however, most manufacturers apply HE or High Efficiency to a fire that is above approximately 70% efficient. But what is the difference between a normal and a HE fire? The most noticable and most commonplace difference would be a glass-front. Common Sense would suggest that putting a glass front on a fire would prevent the heat entering the room and push it all up the chimney, but this common assumption is actually the opposite of what happens and actually dramatically reduces the draw of the fire so less heat is drawn up and out through the chimney. It also means that when the fire is not in use there is less of a draft running through the house. Although heat-proof, the ceramic glass will also radiate heat, this is the same infra-red, this is the same type of heat that is given off by glowing embers or logs. The second is a convector box, this is a channel that goes around the back of the firebox, allowing cold air to be drawn in at the bottom of the fire, warmed as it travels around the back of the fire and then allowed to leave at the top of the fire. This utilises the natural convection of air to circulate the heat around the room. The glass front also holds the hot air from the fire for longer allowing more of the heat to be transferred to the air circulating around the back and increasing the efficiency further. One of the more efficient HE gas fires on the market is the Apex Capacious which has an efficient rating of 89% this means that only 11% of the energy is wasted up the chimney and when compared to something like the Valor Seattle at 51% efficiency then it is a saving of 38% which is quite considerable, especially in this economic climate and rising energy prices. This could equate to saving 10p every three hours the fires are lit at the average gas price of 2.2p per kW/h which would quickly add up and start saving pounds instead of pennies.